ORION – At 99 years of age, very few persons are still active missionaries. But for Orion’s Bernice Stropes, her mission work began in her late 80’s. Inside her home, a second bedroom has been converted into a one-woman sewing operation that has provided clothing for the children of Haiti for more than 10 years. And while Bernice doesn’t leave home, she is making a significant impact in the life of newborns at Grace Children’s Hospital in the Haitian capital city of Port-au-Prince. 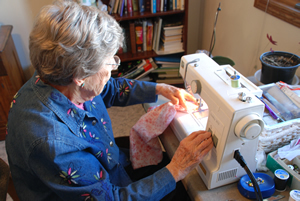 With the help of the Midwest Mission Distribution Center in Chatham, Bernice’s boxes of sewing along with other seamstresses across the conference are providing the hospital a steady supply of clothing. Bernice said she makes a variety of tank tops and shorts for the boys and A-line gowns and shorts for girls based upon patterns which are now available at the Distribution Center. She has also sewn layette gowns for newborns and school bags for school supplies. MMDC Director Pat Wright, who recently returned from a trip to Haiti, met the head nurse at Grace Hospital, who was well acquainted with Bernice’s handiwork. “The nurse said to me, ‘Thank you for shipping these clothes for the children because without them, they would have nothing,’” Wright said. During this time, Bernice sponsored a Haitian child through World Vision International, but she has lost contact with the child after she moved out of the area. “I still pray for her though,” she said. Schultz said the Orion congregation has also gotten involved with Bernice’s ministry. Many in the congregation provide financial help in purchasing material for Bernice or donating supplies. Bernice will celebrate her 100th birthday on Dec. 23 but it is doubtful that she will be slowing down. 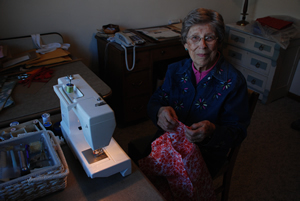 Schultz said Bernice fell several years ago and she continued sewing – sling and all. And she walks daily at the local Lutheran Church gym. She says she does that in order to keep going. And she also participates in another ministry of the church by driving others to church that would have no other way to get there.